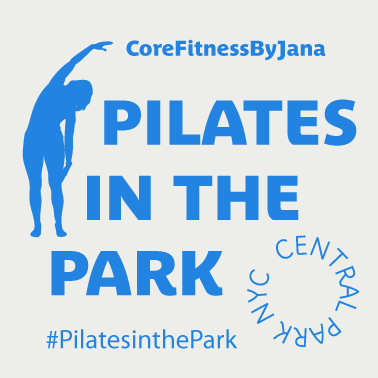 Start taking classes at Pilates in the Park and other studios! A series of mat exercises based on the work of Joseph Pilates to strengthen and lengthen muscles with a focus on the body's core. There are no upcoming “Outdoor Pilates Mat” classes on this day. Students are encouraged to bring a mat. Jana keeps a handful of mats on site on a first come, first served basis, and she is generally at the location 10-15 minutes before the start of class. Classes may be cancelled due to weather, either in advance or on short notice upon those summer thunderstorms. This "studio" is the great outdoors, situated under shady poplar trees overlooking the Central Park tennis. Classes are in a small fenced in field at Mid-Park. Enter Central Park from West 93rd or East 96th and walk towards the tennis courts in Mid-Park. They are west of the tennis building, just south of the courts but overlooking court 1-3 and just north of the reservoir and bridle path. Bathrooms, beverages and showers are available at the adjacent tennis center. Visited from San Francisco and this was a super fun way to see the park while getting exercise in. Really good thorough workout Thanks! Reminded me just how weak I am! Fantastic workout. Such an inspiring class! Training outdoor (and in that location) is incredible! Jana is very clear in explaining every step of the training. I really enjoyed, I couldn't help to smile and be relaxed at the end. Janna is a bright person and motivating teacher -- I left feeling taller!